When I was a kid I used to play office, school, or library. For me this didn’t really equate to having pupils or play acting an office or library situation. What it essentially boiled down to was playing with paper. But not just any paper, you couldn’t give me some scratch paper, or a pad of paper or a fresh envelope or anything like that. To have any sort of value to me it had to be something that had once had a real, adult, purpose. And I wasn’t the only one, my older sister and even some neighbor kids got in on the act as well. We would go dumpster diving at the school near our house and pull out anything that looked official. One time we found the holy grail of school-related paper: A grade book. A red, hardcover, spiral-bound, grade book with lots of ruled rows and columns and cut-out tabs. We would also collect unwanted mail from our parents and trade the best pieces back and forth as if they were baseball cards. Our favorites were envelopes with windows and things that were, or looked like, bills. Junk mail was not our thing. I’m guessing the 2 or 3 others in that small social circle grew out of their interest in playing with mail and other sorts of papers, but for me it went the opposite direction. My fascination wasn’t just with paper, pretty much any office supply or equipment could hold me in thrall. 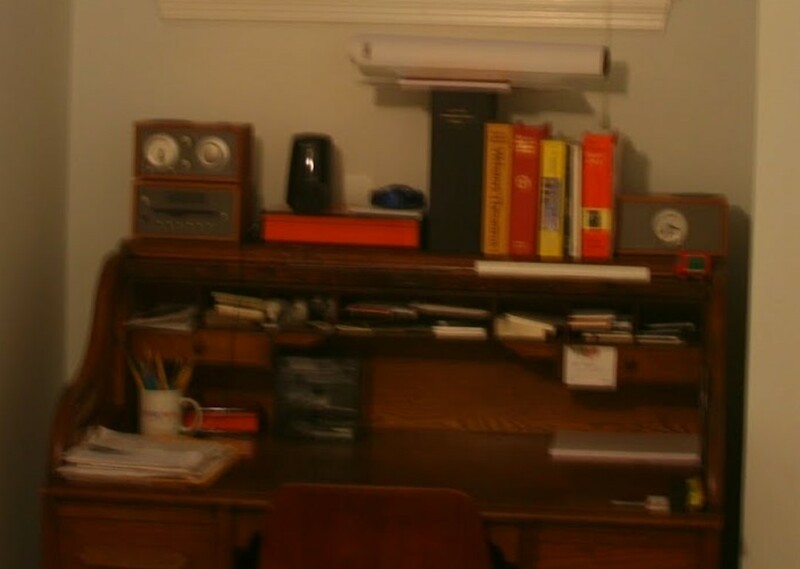 In the early 1980s I even cut out and pasted pictures of the earliest home computers and taped them to my nightstand. I didn’t care what computers could do, I just liked the way they looked. What has me thinking about all of this? 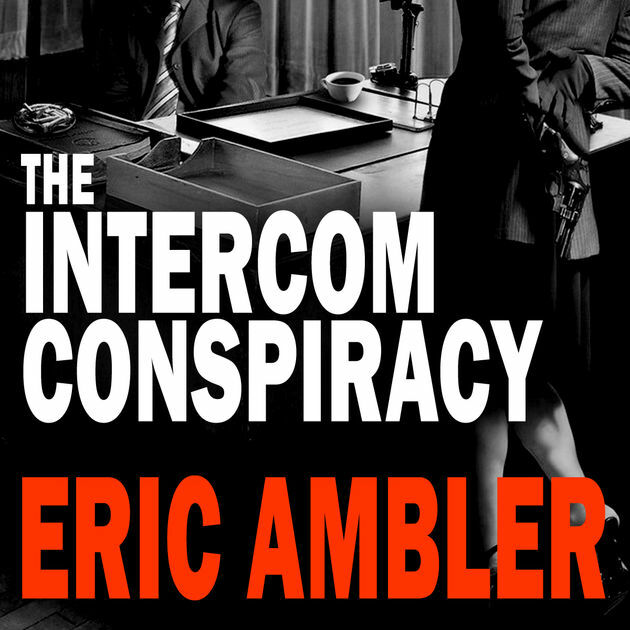 I’m currently reading The Intercom Conspiracy by Eric Ambler. A spy thriller from 1969 that centers around a right-wing newsletter called Intercom. There is plenty of nail-biting intrigue involved but there is also lots of paper. 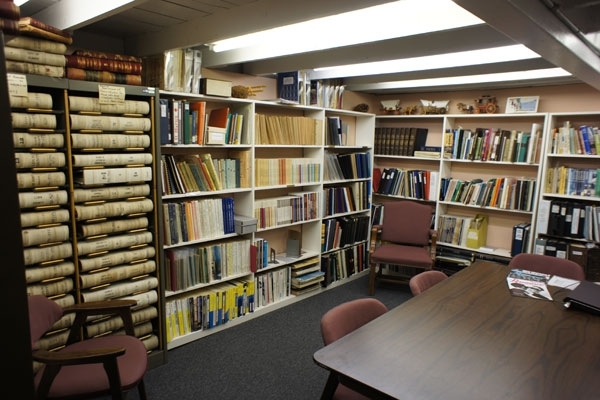 Reference books and libraries and mimeographs, mailing lists, telegrams. I could read about that stuff all time. One can only imagine the paper that could pass through those in/out trays. We need to nix the cigarettes though. My nostalgia does not extend that far. I would love these books for other reasons but the paper/office details in other literature also pleases me. Wilkie Collins’s The Woman and White, so much letter writing. The scenes in Howard’s End (movie version) where Leonard Bast works in the Porphyrion. Many of Barbara Pym’s characters, indexers and what not. 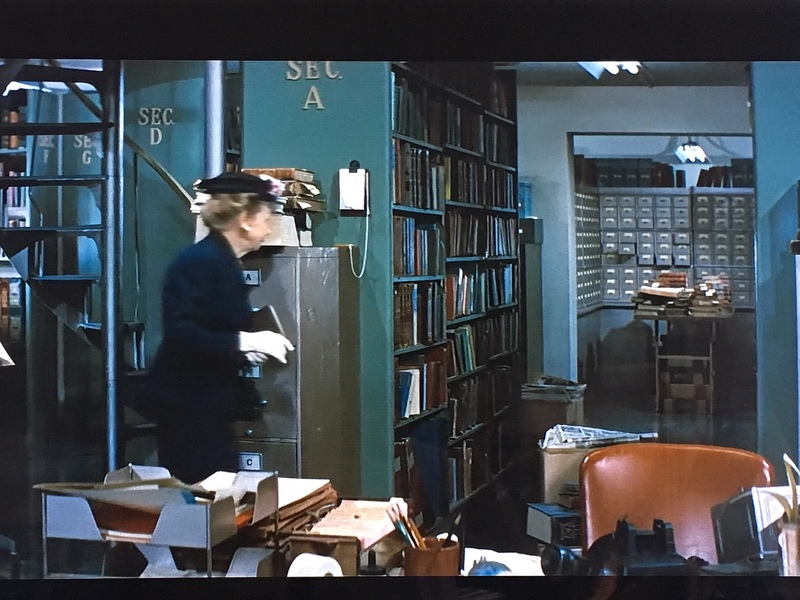 Fanny in Look at Me by Anita Brookner works in a medical reference library. From the 1957 film Desk Set. This pretty much captures a bit of heaven. A reference office at a TV network (or something like that). There is not one object in this photo that doesn’t interest me. I also like the notion that of pre-Google reference queries/sources. Although in reality it would piss me off these days. I remember calling libraries with reference questions, but I wouldn’t want to go back to those days, functionally speaking. Much less appealing than the previous picture, but still fun. From the 1958 Teacher’s Pet. A news room. Must have been loud as all get out. And by the way, Clark Gable was in this film. Not only was his character a gross, old, lech that Doris Day should not have had to kiss, but his acting was awful. All the subtlety of a sledge hammer. 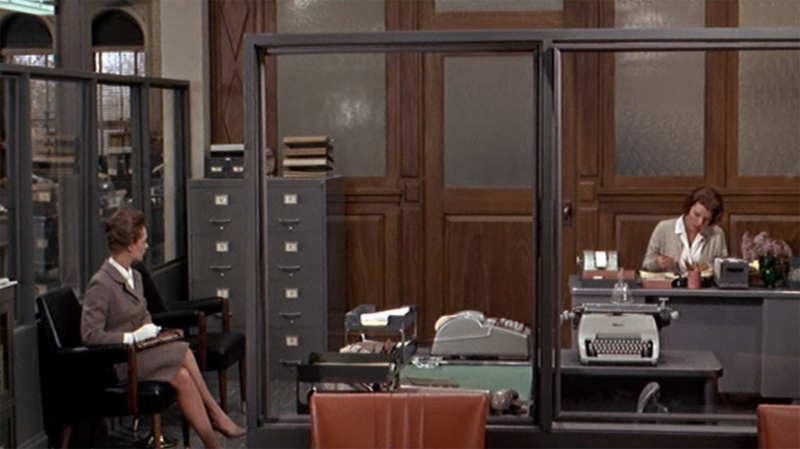 The only reason I liked Alfred Hitchcock’s Marnie was for the opening scenes in this office. Once she embezzles the money and takes off I lost all interest. Not only is Six Days of the Condor one of my favorite thriller novels, but the film Three Days of the Condor is equally fabulous. I couldn’t resist posting this picture although it has nothing to do with offices. There is a website called Polyvore where people come up with looks and where one can buy the clothing. I love this one of Robert Redford’s character in Three Days of the Condor. Which of us doesn’t love 84, Charing Cross Road? So much paper and books and brown paper packages. 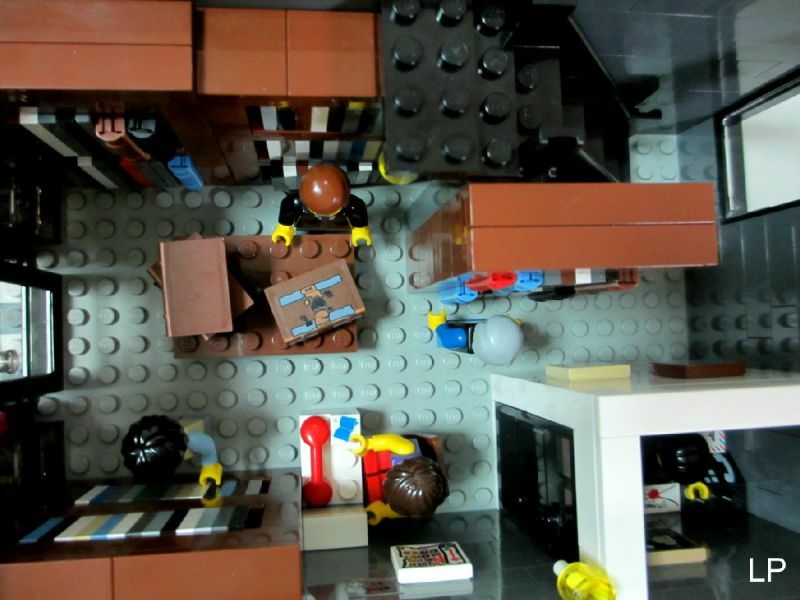 This is an amazing LEGO creation of one of the rooms at Marks and Co.
You really need to follow this link to see the entire Marks and Co in LEGO created by someone who loves the book. I love little reference rooms. My favorite part of those genealogy shows on TV, or history detectives is when they go to some super local, small archive or reference room. I love the juxtaposition of equal parts hidden treasure and useless, hidden, information. And how one can become the other. This picture is from our pre-renovated house in 2010. This was a roll top desk that John had as a kid but had been in storage until we moved into our house. I quickly colonized and loved he heck out of it. All those drawers, ledges, and cubbies. Unfortunately, it was sold before the renovation got under way. I love my little reference collection which is largely no longer needed. My cup o’pencils, electric pencil sharpener on top, papers, files, even my little Tivoli sound system. God I loved that desk. your parents must have been thrilled you had such a cheap hobby. Though maybe they were a bit worried about the fire risk. You would have loved one of the offices I had as a junior reporter. Old Remington manual typewriter, massive solid wood desk, agendas from council meetings stacked high and we had to type our stories using two sheets of carbon paper -so three copies of every story, every day. A lot of paper…. It never came close to hoarding levels of fire risk. We were poor so it was a good thing I was cheaply amused. We had a Royal manual typewriter that we got free from someone. I loved it. Oh wonderful stuff! I had the same obsession as a child and ended up working in many offices (still am, actually!) But I love all the old stuff – manual typewriters, early photocopiers, old libraries with a card issuing system – *sigh*. We still have two old manual typewriters which I will *not* allow to be sold…. In high school I worked at our city library and loved all the cards. The card catalog. A card catalog-like file system for library card holders. The files by due date of the books that were checked out. The date due cards. The index files of outstanding fines. I loved all of it. I’m a proud lifelong officephiliac, too! One of my favorite things as a kid in the late 60s/early 70s was when my Dad would take me to the office on Saturday mornings to catch up on paperwork. He was a design engineer for a Chicago railroad company and managed a corral of draftsmen (and they were all men back then). It would be just the two of us in this grand old 19th-century building. He’d be down the hall in his office and I’d go to the drafting room where I’d sit at each of the drafting tables and in turn admire the tools they used, noticing the differences in pencils, ink, erasers, rulers, and whatnot, that each draftsman preferred. I can still smell that wonderful place. That would have been heaven. Once or twice I went to the office with my dad on the weekend and helped add up sheets of figures on an adding machine. He always had to recalc them b/c my answers were never right. Important pencil cup question. I couldn’t tell from the photo of your desk if you prefer to have your erasers or your lead facing up. I noticed in the Desk Set screen shot that they have leads up. I’m a lead down/eraser up person. Can’t stand when my erasers get all smudgy. Which way do you prefer? In that picture and on my desk at work, all of the pencils are points up. If you start with fresh cup and are consistent there is nothing to get the erasers smudgy. Brilliant – I love offices and desks and have a (non-roll-top) old fashioned desk as my work desk, with all the cubbyholes filled with BOTTLES OF INK. I couldn’t trust myself with bottles of ink. Big mess. I’ve had the odd splash over the years, but nothing too major. My goodness, yhere must be a gene for this. When I see Desk Set or 84 Charing Cross I feel like a pig rolling in mud. Ols card catalogs is what I miss most. Just touching the cards in the library gave me relief from the stresses at home. I am so glad there are others in this world who understand. There must be a gene for it. Whilst not quite sharing your love of stationery, I think once you get to a certain age nostalgia kicks in for the pre-technology office. I do get annoyed when modern set designers get it wrong – I have recently been watching repeats of ‘Life on Mars’, in which a policeman is transported back to a police station of the 1970s. Far too dark, and no sign of filing cabinets! 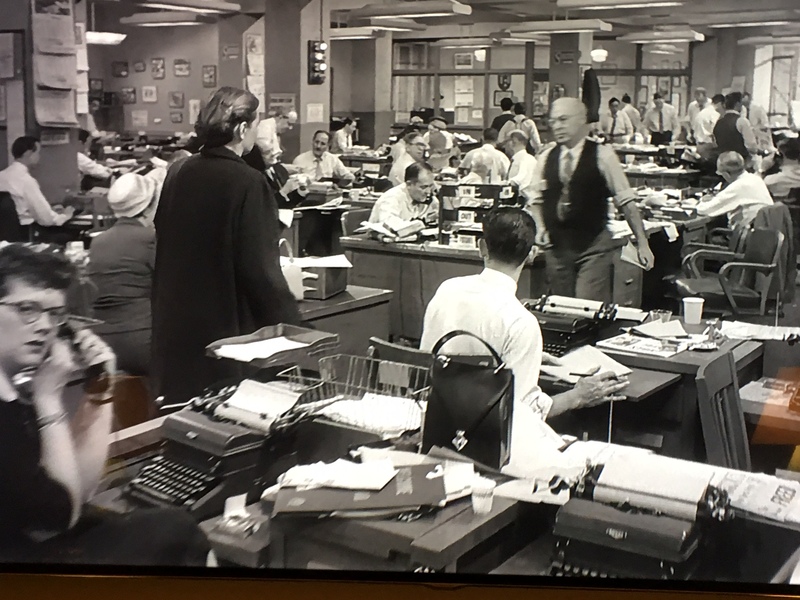 I’m a particular fan of offices in old movies/TV. That way I’m not guessing what they got right or wrong. I am the worst typist in the world, so I am very glad for computers in that respect. However, I do have some nostalgia for my early years of office work prior to email…letter openers, date stamps, company stationary etc. I occasionally still have to use a type writer at work, for certain forms, pdfs that need to be modified which is fun since I don’t have to worry about margins and all that. I never would have imagined that 84, Charing Cross Road and Lego would intersect! Yes, yes, yes. My typing has gotten worse with the advent of the computer. Much backspacing. I was better in the days of the typewriter. Love this! And, of course, share this fetish (love/affliction/officephilia). I used to go to the office with my Daddy just so I could play in the big supply closet – they had all these old adding machines — the kind where you punched in the numbers and then had to pull down the handle — anybody remember those? Never mind the old typewriters and carbonated forms of various kinds. I was happy as a lark for HOURS in that big closet, and no one seemed to mind that I was there. I’ve been away from the blog world too long – to think I almost missed this! Thanks for sharing. I had a bit of a blog hiatus myself. For newsrooms, I would recommend All the President’s Men. That definitely ticks a few boxes. A most interesting post Thomas. One of the things I loved about John Le Carre’s George Smiley character was his obsession with maintaining proper files and filing systems. With the exception of microfiche, back in the Cold War period EVERYTHING was on paper and the effective management of all this “hardcopy” was a skill respected as much as good tradecraft (at least in Smiley’s world). One day I am going to get into John Le Carre. I know I will enjoy them but so far I have had trouble getting past the first 30 pages or so. I think I need a cheat sheet that lists all the characters and their affiliations. Who would have thought how calming these pictures would be. And, of course, in those days of paper files, no one’s information got hacked unless someone broke into the physical office, which was much easier to guard than the Internet. How did I miss this post? I love office supplies too, and I always loved the beginning of the school year when you’d buy fresh notebooks, pencils, and crayons. And I confess to playing library and bookstore as a child. No surprise that I eventually went to library school!